Romeo and Juliet perched in the nest tree. 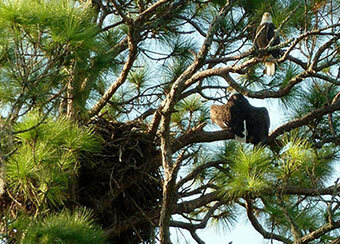 The 2013 – 2014 Northeast Florida Bald Eagle Nesting Season was a terrific experience for the tens of thousands of people watching. 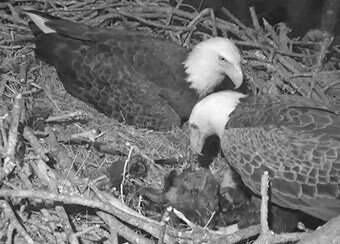 Two eaglets were hatched, grew up healthy and strong under the expert care and watchful eyes of their two loving and experienced parents. 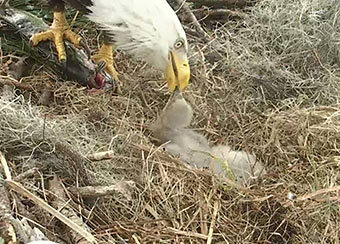 Food was abundant, and the eaglets thrived. Sibling rivalry was always at a minimum, and our viewers rejoiced in spending time watching all the activities in the nest. 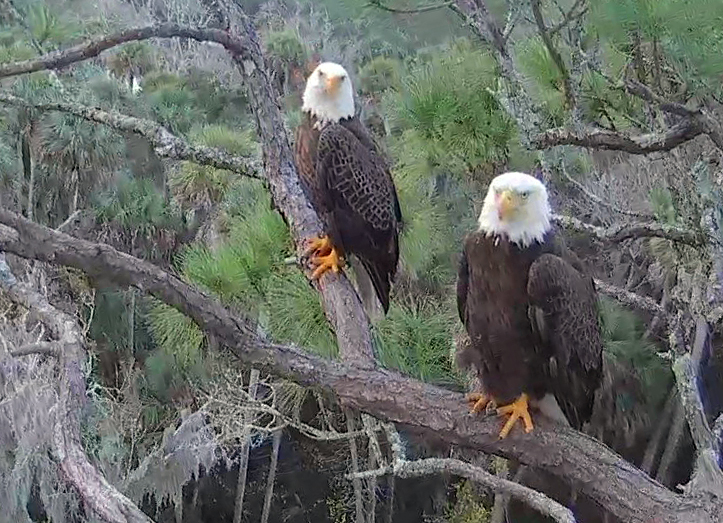 For the first time ever, the American Eagle Foundation, in collaboration with Gretchen Butler, facilitated the live HD video streaming of a wild Bald Eagle nest in NE Florida. See how the cams were installed. Romeo and Juliet, the major players in this real-life adventure, both arrived from ‘summer vacations’ on exactly the same day – August 28, 2013. 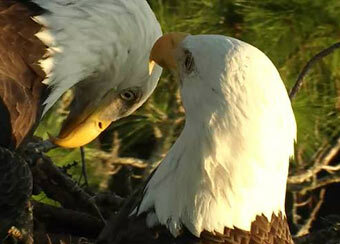 For weeks, nestorations were made by both eagles – bonds were renewed, and mating was observed. 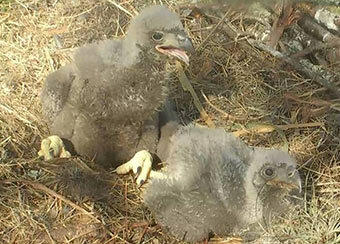 During this time, there were many “visitors” to the nest, and Chatters delighted in seeing Larry the Lizard, owls, juvenile bald eagles (perhaps hatchlings from the same nest), a magnificent Peregrine falcon, and many assorted birds and other critters (in addition to Romeo and Juliet). Our cam operators performed magnificently with dedication and skill, helping to provide a grand experience for our viewers. Our mods are second to none. We appreciate their knowledge and the way in which all viewers are welcomed to Chat. The first egg was laid November 14; the second on November 17. Anticipation mounted as the 35-day incubation period neared its end. On December 20th, Romeo and Juliet welcomed “Delilah,” the first-born into their family; brother “Samson” hatched December 23rd. We all felt that we had been given early Christmas presents. Romeo and Juliet introduce Samson and Delilah. For the next 4 months, every new skill learned by “our babies” was celebrated by the Chatters. 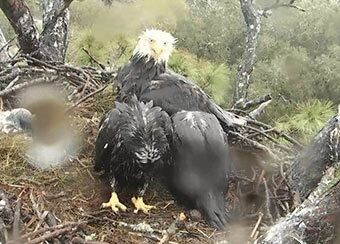 In a short time, Samson and Delilah (the chosen names for the 2 eaglets) became best buddies in the nest, and were often seen snuggling or sleeping together. 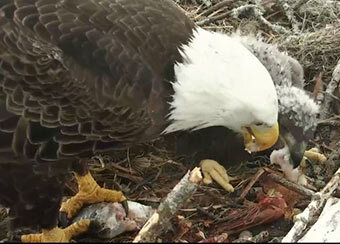 This was a “happy” nest: food was in abundance – fish, squirrel, and water fowl were the main menu items. There was very little sibling rivalry between Sam and Del, and as they got older, they seemed to be best buddies, sleeping and snuggling together. 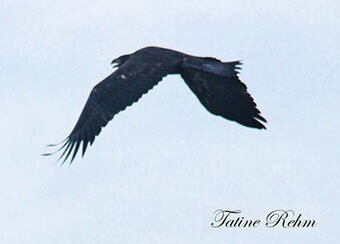 After fledging, they sometimes flew together. Del left the area much sooner than Samson – April 7, at 108 days old – while Samson left April 22, at 120 days old. Many of our viewers thought they would leave together, and perhaps they have joined each other by now. Live long and prosper, Samson and Delilah! The parents stayed a few weeks longer before departing separately. Romeo was last seen May 7, while Juliet lingered 10 days longer, departing May 18. We look forward to seeing them again in the Fall. Many photos, as well as endearing videos, have been posted on Facebook and Flickr documenting the season and capturing special moments in the nest. From the many photos and videos available to us, we have chosen what we hope will be a memorable scrapbook of the nesting season. Nestorations ~ a time to renew bonds, refurbish the nest with sticks and fluff, and prepare for the season ahead. The home of Romeo & Juliet. 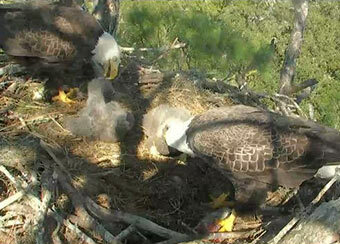 They returned to their nest August 28, 2013. Nestorations began and many sticks were brought in. Romeo & Juliet spent “bonding” time together. They have been together many years. They worked together, not always agreeing where a particular stick should be placed. There were many visitors to the nest before the eggs were laid. Is this a juvie hatched from this nest a few years ago? Romeo was very tolerant. 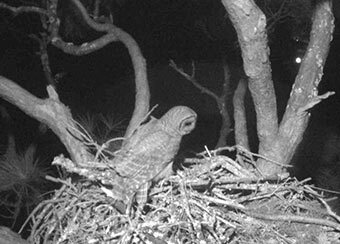 Our infrared cam revealed an owl looking things over. It’s not your nest, Mr. Owl! 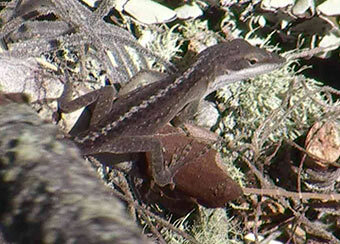 One of the first visitors was a little lizard. The Chatters named him Larry. 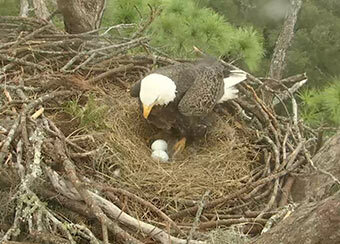 Eggs were laid November 14 & 17, 2013 with Treasures inside! 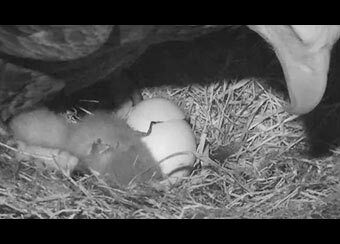 November 14, 2013 — We have an egg! Carefully rolling the eggs to keep the life inside safe. NE1 (later Delilah) began her journey out of darkness. 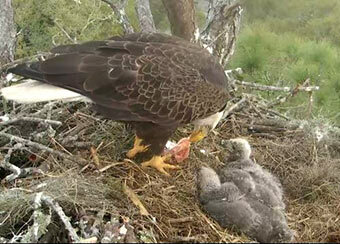 While NE1 slept, NE2 (Samson) hatched. November 17, 2013 — A Second Egg! Constant attention from both Romeo and Juliet. 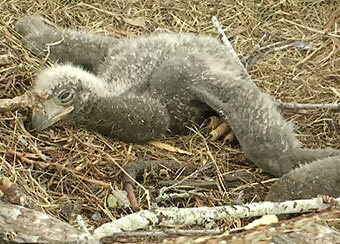 A tired little eaglet sleeps. It was a lot of work for this tiny little one to break free. Samson joined the family Dec. 23, 2013. The infrared camera captured every moment. One-day-old Delilah and soon-to-be-hatched Samson. Romeo and Juliet were fantastic parents. Romeo & Juliet! Samson & Delilah! Baby wings & pin feathers. The glow of the afternoon sun. Where did our Bobble Heads go? Mom prepares dinner. Kids are lined up, ready to eat. Afternoon sun highlights full crops. Samson and Delilah are into their fifth week. 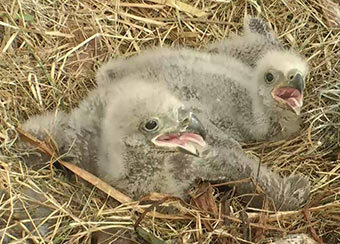 “Dandelion” feathers sprout from their heads. Always ready to eat again. 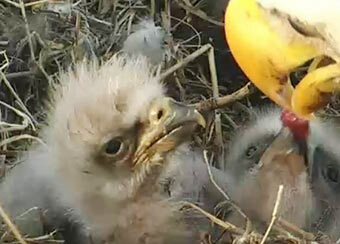 9 weeks old, and eating on their own. 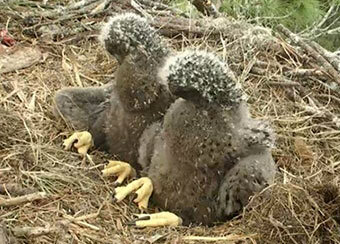 Healthy, strong eaglets. Del eats while Sam watches. 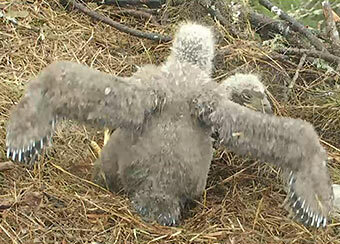 13 weeks old, & almost ready for their first flight. 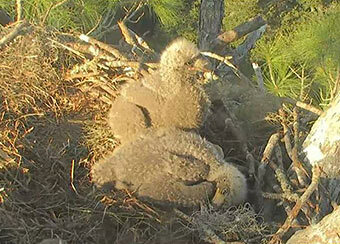 11 weeks, perched confidently on the nest tree branch. 15 weeks old. Sam waits for Del’s leftovers. 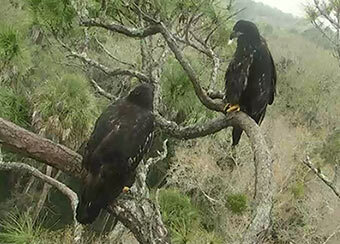 Branching is a major step in the growth of the eaglets. Both Samson & Delilah branched on the same day: March 2, 2014. Sam was 9 weeks 6 days old; Del was 10 weeks 2 days old. Practice makes perfect – and Sam and Del navigate hopping from one branch to the other. Vigorous exercising, hovering in place in the nest. 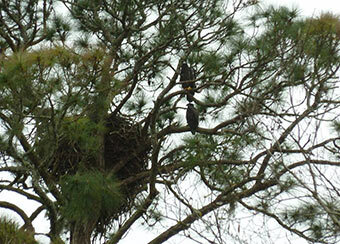 Both eaglets perched in nest tree. Preparing to fly, strengthening wings. 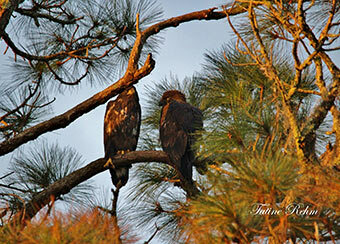 Beautiful eaglets catch the afternoon sun. 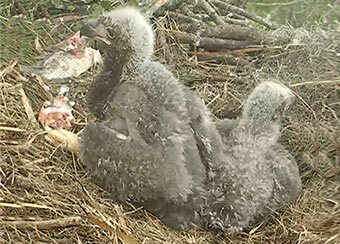 Fledging is a critical milestone. 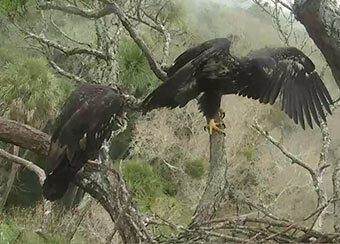 To take a leap of faith and execute a decent landing the first time is a daunting task for eaglets. 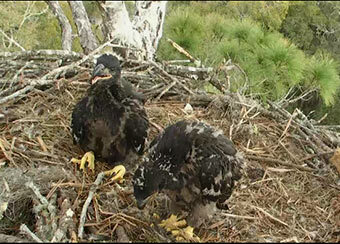 Sam (the younger by 3 days) went first, fledging on March 8, 2014. 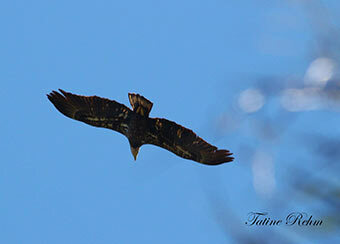 Del seemed to want to go, and looked closely when Sam would soar above her. 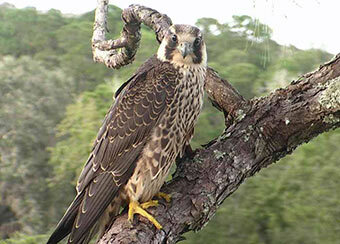 She fledged on March 12, 4 days later. Then they were off on regular excursions, enjoying the sky and each other. Note: All the pictures in this group were taken from the ground by Tatine Rehm. 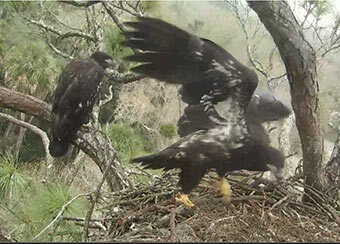 Sam fledged first, landing in a nearby tree. 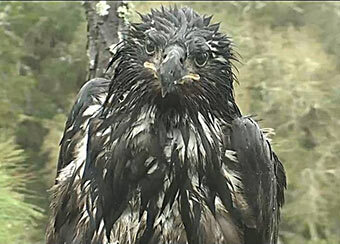 Del joined the fun, and fledged on April 12. The sky became Sam’s new playground. 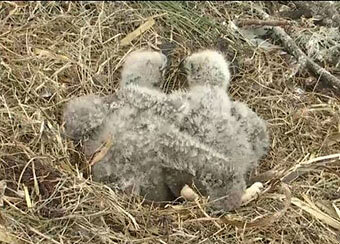 together in the nest for the last time on April 7, 2014. The infrared cam provided many opportunities for night-time viewing. 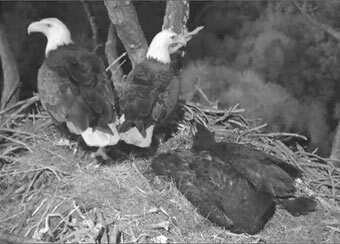 Juliet watches over her baby eaglets. Everyone present and accounted for! 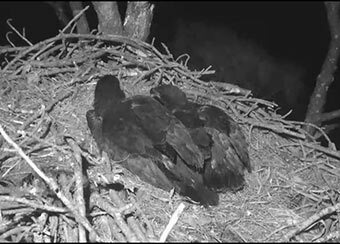 Big eaglets can sleep alone! 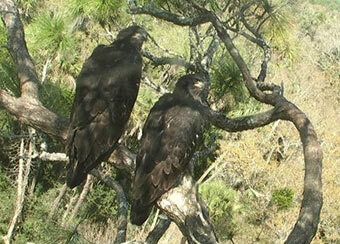 Juliet and Romeo keep watch as the eaglets snuggle in sleep. Juliet and Romeo are close by, napping and watching. Rain, rain, go away! Sometimes it’s great to wash away bugs and dirt, or to cool off. At other times, it’s just something to put up with. 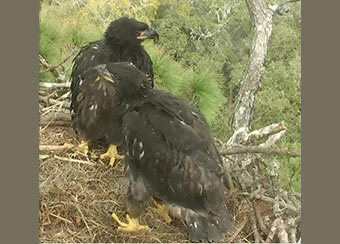 When eaglets are very small (and even when they grow much larger), they shelter under Mom or Dad’s wings. Juliet’s “mombrella” shelters the babies. Your feathers are a mess! Soaking wet—and no umbrella available. 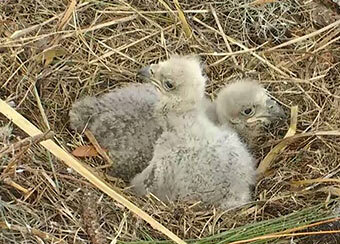 The HD cam’s resolution was just incredible, and our cam operators gave us closeup views that were amazing. These are just a few. 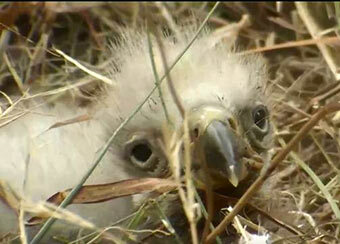 Baby eaglet nestled in the deep nest bowl. 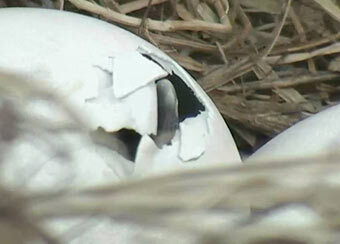 The egg tooth is clearly visible. Experienced parents were very patient. Special thanks goes to Gretchen Butler, Glenn Gouldey, and Tatine Rehm. Gretchen spearheaded the effort, and she and Glenn were our techs on the ground to ensure that the cams and internet stayed on. 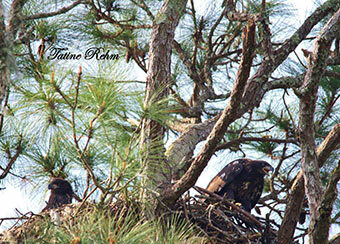 Tatine Rehm’s photographs of this nest are spectacular. 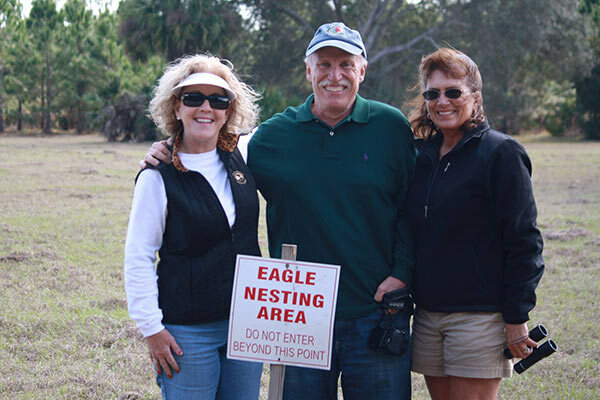 All three are devotees of this nest, experienced and knowledgable eagle watchers, and have been such an asset in this experience. In preparation for the mating season, Romeo & Juliet are giving each other little “beak taps” to get the other one’s attention. Video by ncaerie – 6:47 minutes. By Dragonlainey – 6:16 minutes. 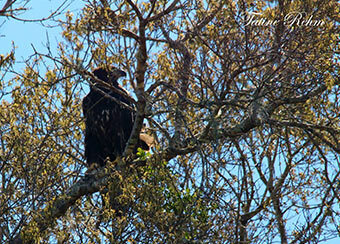 Sub-adult eagle shows up (perhaps hatched in this nest a few years ago). Parents not around. Juvie starts moving sticks. 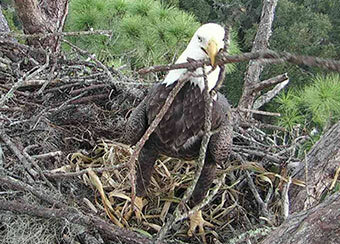 Romeo flies in with huge stick and the pair try to find a good place in the nest for the stick. Close up video by Mocha Mama – 4:57 minutes. Clarity and streaming really good. 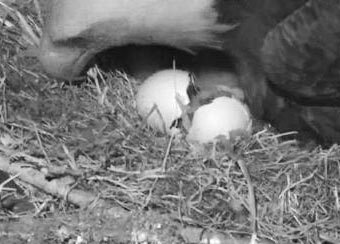 A brief glimpse of eggs. 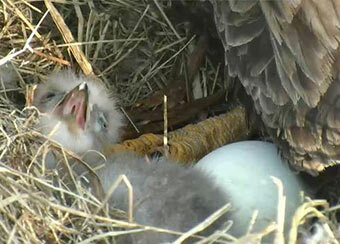 Juliet gets up, and we get a look at the eggs…. can you hear the peeps? By Mocha Mama – 3:23 minutes. YOU WILL NEED TO WATCH THIS VIDEO ON YOUTUBE because of embedded music. Just click the link provided. It is an absolute stunning video. 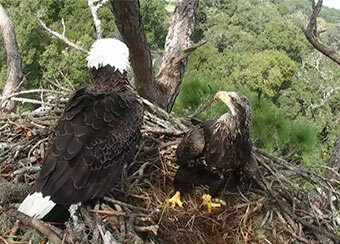 AEF NE Florida Eagle Nest Cam, 20 December. 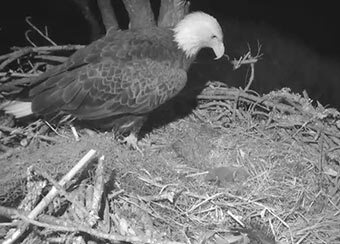 Beginning with a visible pip the night before, and continuing for the next nineteen hours, the first 2013-2014 eaglet pecked and pushed its way out of its egg. The hatch was declared “official” at 16:26 EST. By Pete Wachsberger – 9:29 minutes. 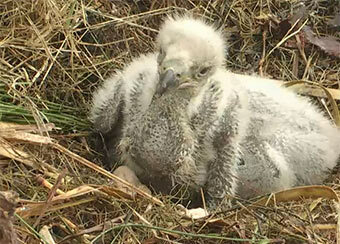 This is also of first eagle hatch, but a much shorter version. No music, just wonderful natural sounds from the nest. Soft peeps. Good clarity. By eaglewhisperer18 – 1:45 minutes. 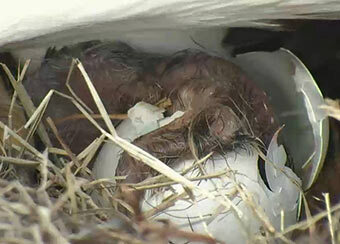 Excellent closeup of baby & 2nd egg pipping. By Mocha Mama – 6:25 minutes. 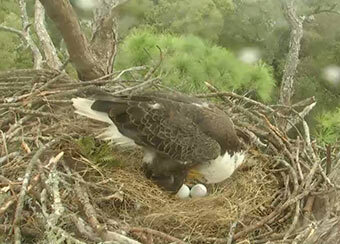 The second egg laid in the NE Florida Nest (Sponsored by the American Eagle Foundation) has hatched. This video is a compilation of special moments in a 2-day-long process. 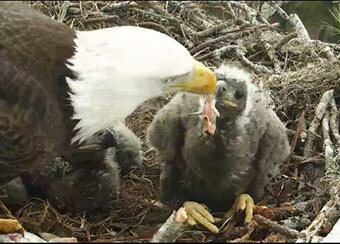 At the end of the video, the two little eaglets scramble for food served up by Mom. We wish them a long and happy life, full of adventures, plenty of food, and families of their own. Special thanks to our cam operators and moderators. Music: (YouTube) “Getting There” by Silent Partner. Video by STE. 1:33 minutes. 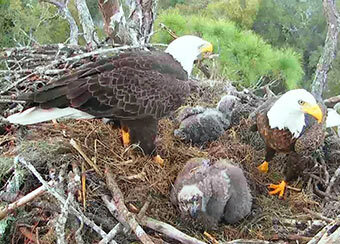 In this AEF video, the Eaglets are 7 and 4 days old. 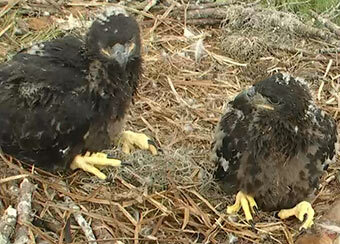 Already much larger and alert, they are fed several times a day by both their mom and dad. 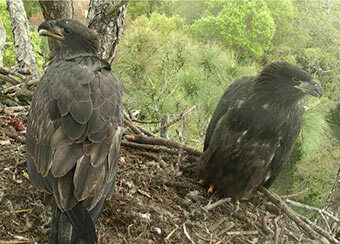 While one is on nest duty, the other often hunts and brings food back for the babies. 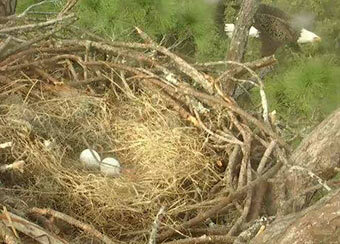 Notice the fresh pine branches in the nest. 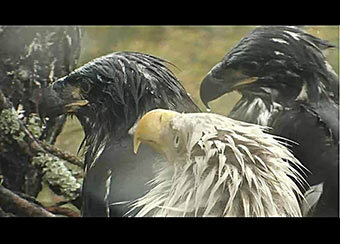 It is thought the eagles do that to freshen the nest. So far, all is well – babies appear very healthy, and parents are extremely gentle and attentive. By STE – 6:28 minutes. Romeo and Juliet and NE1 and NE2 enjoying the evening sunset. By Mocha Mama – 3:50 minutes. Juliet in the rain; Music: Raindrops Keep Falling on my Head…. Infrared, not much action, just a very patient Juliet protecting the babies. 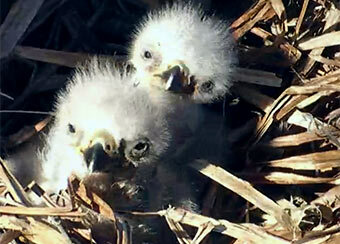 HD cams give great closeup on eaglets’ ears. By Mocha Mama – 4:42 minutes. 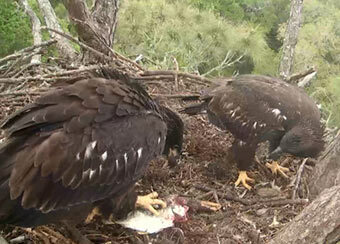 Self feeding by Sam – then Del gets in on action. 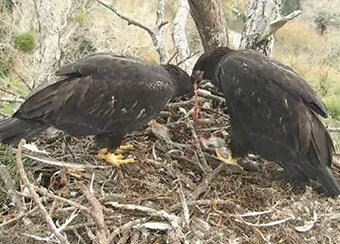 Milestone for eaglets – excellent video. Great clarity. Infrared cam picks up all the action during a storm. 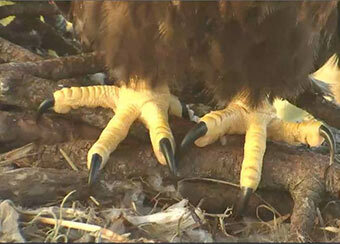 By eaglewhisperer 18 – 7:32 minutes. Span time: January 2 – 9, 2014. 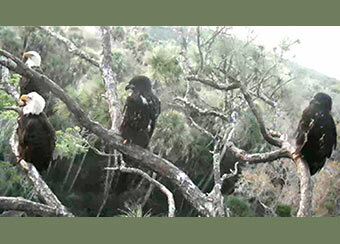 The eaglets in this AEF-sponsored NE Florida nest are The last footage in this little video was captured January 9, 2014. 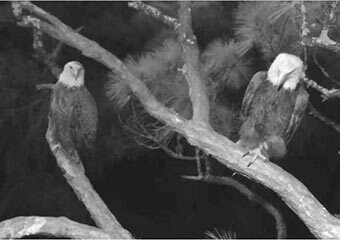 Having recently been given the names “Delilah” (formerly NE1) and “Samson” (formerly NE2), the eaglets in the video are 20 and 17 days old. They are losing their down, which is being replaced by pin feathers. Their color is becoming more gray. They are venturing outside their nest bowl, balancing better, able to regulate their body temperature. Both are thriving. Eating well, active, inquisitive. 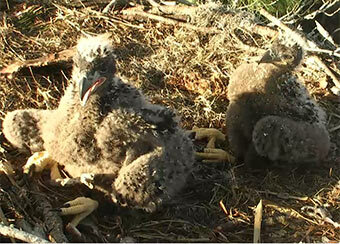 Food is plentiful and the parents are very attentive. By STE – 7:41 minutes. Kids in the nest. Sam gives Juliet a kiss. Cute video with music. A full-length movie! An hour in the Hamlet. Get some popcorn and enjoy the show. Lots going on in this video. Sunday morning Family Fun. Romeo brings in a stick and sets it on Del. Too funny—and then Romeo and Juliet have some beak kisses. 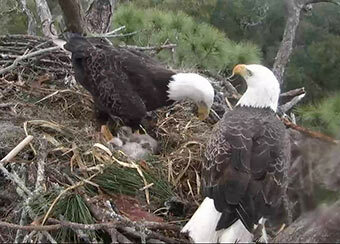 Nest time around 9:45am! By Mocha Mama – 4:03 minutes. 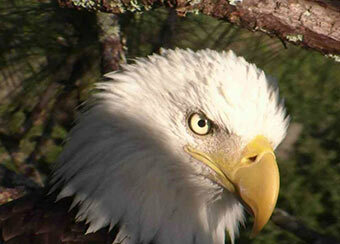 Samson is first to branch at 8:15 a.m. nest time. By Mocha Mama – 4:34 minutes. By Mocha Mama – 3:21 minutes. On the morning of Mar. 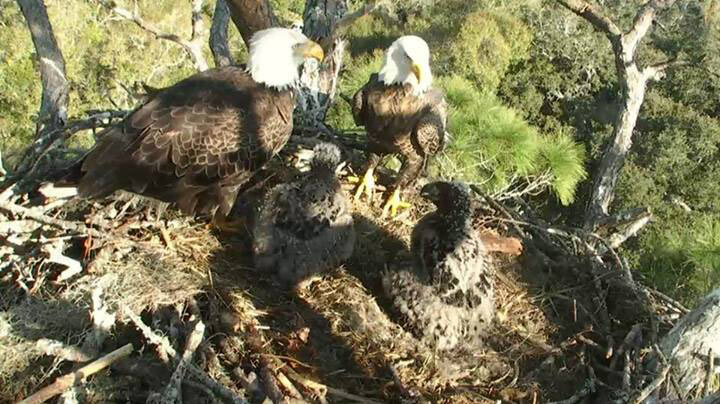 8, 2014, at about 7:15 EST, Samson, an eaglet in the NE Florida Bald Eagle nest, fledged. 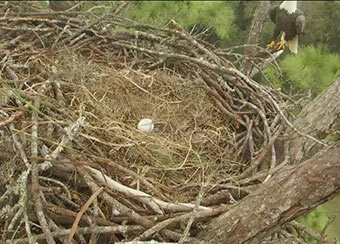 He was gone all day, but returned to the nest around 6:00 p.m. EST. He looked around for some scraps of food, then returned to a branch in the nest tree. 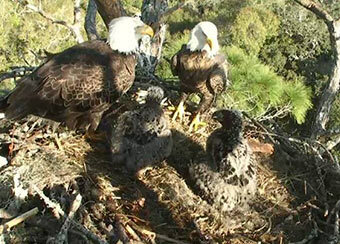 Samson hatched December 23, 2013, so he fledged at exactly 75 days old (10 weeks, 5 days). By Mocha Mama – 4:23 minutes. 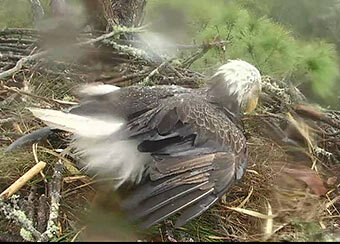 Video shows Delilah flying off at 9:05 a.m. nest time. By Mocha Mama – 4:43 minutes. By Mocha Mama – 4:48 minutes. Season in Review – a really nice slide show. Infrared light. Sam & Del side by side. By Jody Naimo – 1:44 minutes. 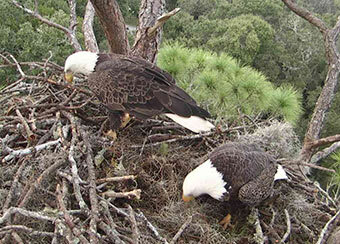 NE FL Eagle Nest Cam, Sponsored by American Eagle Foundation. Samson flies off; Delilah is left behind. 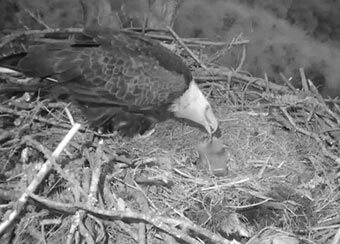 There’s a lot of “talking” going on in this video – both parents have a conversation, and an “intruder” flies over the nest. By STE – 4:49 minutes. Delilah dances with a stick. Super video. By Mocha Mama – 2:48 minutes. To Al Cecere for providing this cam. 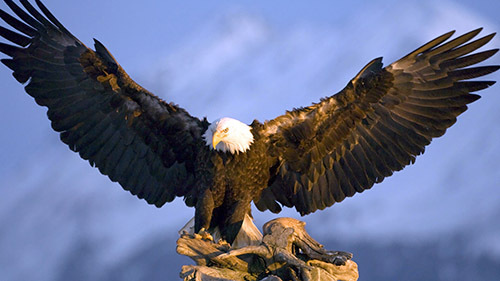 Eagles are gifts to be treasured each day. While watching these eagles soaring above. I’ll see you next Fall for another “squee” fest. Sam and Del at 5 weeks old with Romeo and Juliet in nest.